I know I have mentioned the “sweet and sour taste” many times, but I am not very much used to the real Cantonese style “sweet and sour” sauce — a bit too sweet for me. (Well, not much of a surprise, I don’t even like to have sugar in my black coffee). And if you have come across my previous post, you probably already know what I mean by difference between northern and southern sweet and sour sauces. For the fish, in the North East of China we use “Carp” very often for home cooking, which also carries some symbolic meaning. The pronunciation of “carp” in Chinese is “Li yu/鲤鱼”, in which, “li”(3)鲤 shares almost the same pronunciation with the character “利” (4)（“profit / benefit”. 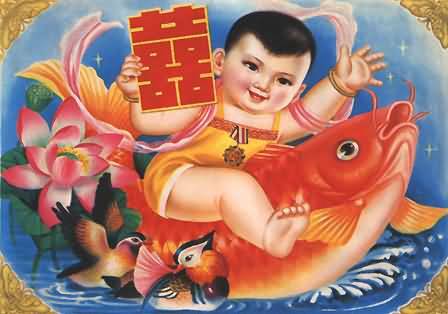 Hence, it has been very popular to use the image of “carp” to symbolize good life, for example, in the typical Chinese new year posters, a boy riding on a ‘big’ fish is one of the most popular posters representing better and better life in the coming year. Well, not much to do with the actual food, but if you order the original “sugar and vinegar fish” in northern China, the fish (carp) is normally presented as if it was going to jump, very similar to the poster. 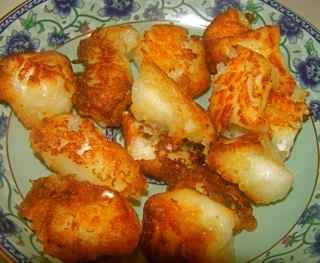 (As mentioned in another post, in northeast cuisine, fish is kept as a whole with head and tail when presented on the table.) 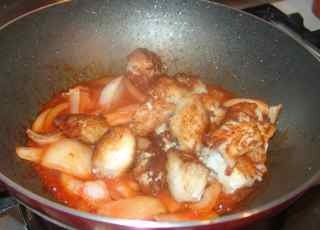 And the sauce, which is made up with sugar and vinegar and tomato sauce, is poured on the top of the fish. Sugar, vinegar, egg, flour, corn flour, salt, oil, onion, ginger. 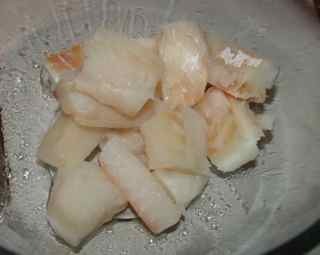 2)Peel and chop 1 onion and a good piece of ginger into thin strips. 3)Mix a full teaspoon of corn flour with water, for thickening the sauce later. 1)In a heated wok, pour around 3 cups of oil. (At least enough to cover the fish pieces when frying). 2)When the oil is hot enough, put coated fish pieces into the oil one by one for frying. 3)When the surface of the fish pieces turns ‘brown’, and is crispy, remove them from the oil. 4) Remove oil from the wok, but remain around 2 tablespoons in it. 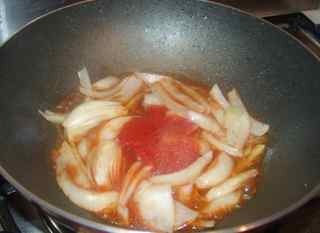 5) Add chopped onion and ginger into the wok, along with around 3 tablespoons of tomato sauce or ketchup. 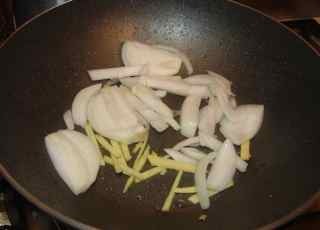 6) When the onion gets soft a little bit, and the smell of onion and ginger comes out, add 1 tablespoon of cooking wine, 1 tablespoons of sugar and 2 tablespoons of rice vinegar into the wok. 7)And the corn flour mix into the wok, and stir everything together well. 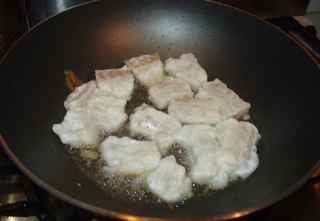 8)When the sauce in the wok is getting thicker ( you will see some bubbling), add pre-fried fish in. 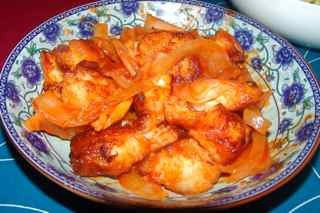 9)Once the sauce generally coated on the fish pieces, turn off the fire and remove the fish to the plate quickly. —– Here you go, done!